Two circle dogs live in a big, square house with Mama, Papa, Big Sister, and Baby. They like to run, dig, jump, and eat circle snacks. Most of all they like to sleep. 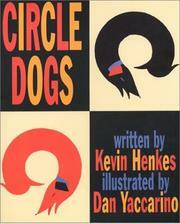 Henkes, Kevin, “Circle dogs,” Children's Picture Book Database at Miami University, accessed April 21, 2019, https://dlp.lib.miamioh.edu/picturebook/items/show/7149.